My n00b attempt at taking fireworks pictures at the National Day Parade Preview 2008. Pardon me for the bad quality. It’s my virgin shot of fireworks taken with my digital camera and without a tripod. Image turned out noisy due to high ISO used. There’s lots of smoke in the air as well. 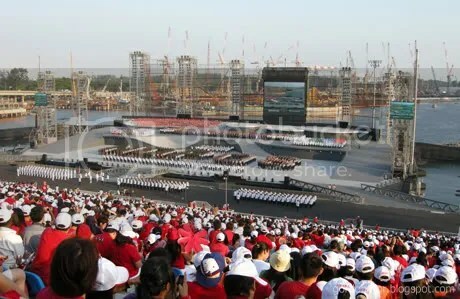 I was lucky to has won 2 tickets for this year’s National Day Parade. This one I went to was only a preview. The actual show will be next Saturday. The construction in the background is a Integrated Resort (IR), an euphemism the government gave for Casino. 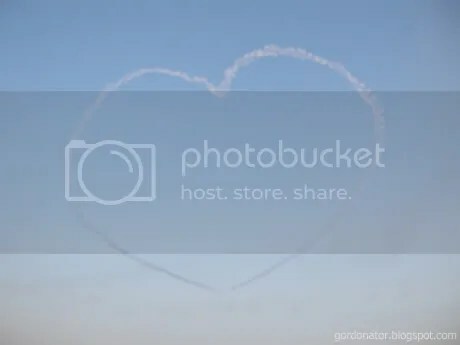 Smoke in the sky in a form of a heart by F16 fighter jets. End of the parade. All the performers gathered on the stage while the audiences make a mad rush for the exit. 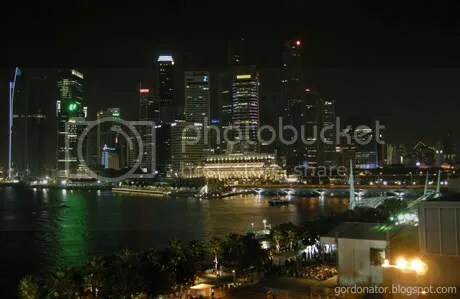 Took a picture of the Central Business District on my right before leaving. i am gonna preempt your eventual obligatory wordpress post and congrat ya on the wordpress shift! Wow.. I didnt expect you to move this early.. Well, since you did it already, I might as well rescheduled mine.. I still have so many bugs to fix..
WORDPRESS. You should move too, K. You got your own host right? Also, you need a tripod. 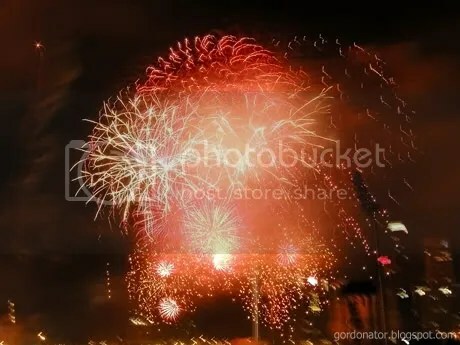 I could not begin to count the number of dSLRs that night when I went for some preview nearby on my mom’s birthday and we happened to want to see some fireworks. Think we were on the bridge, wonderful view there. Wonderful numbers of tripods with dSLRs too. Night shots. Argh. HAPPY BLOGWARMING PARTY? If you have any questions feel free to ask yeh? Congrats on your move! I can NEVER win any tix. damn. oh well.. dont know to consider myself lucky or unlucky. this year the National Day mood is at an all time low. 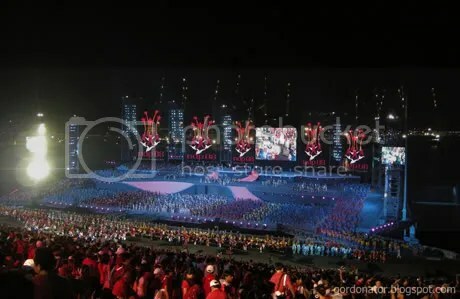 i don’t see them playing national day songs on the TV or radio. and i afraid we are going to see reruns of old movies like previous years. ya it’s strange. it’s like most started out at blogger then eventually move to wordpress. i didn’t bring a tripod as i never expected them to have fireworks. surprisingly i didn’t see much DSLR on that day. most are using digital cameras and even handphones. lol. u can start by teaching me how to hack wordpress into giving me the ability to insert flash and adsense. watch at home better i guess. the weather is so hot and the goodie bag is so ugly. Done the URL updates. Going to kill you for that. The aerial performance is done by the local Black Knights. Their display is similar to those on the Singapore Air Show earlier this year. You’re actually fortunate its cloudless on Sat. Its hard to view the aerial displays when its cloudy.